The plan has been described by experts as anything from ambitious to impossible, but a new report by Cairn ERA, a global research and consulting firm specializing in energy storage, gives an interesting new perspective on Tesla’s production plan based on the recent rise of Chinese automakers. 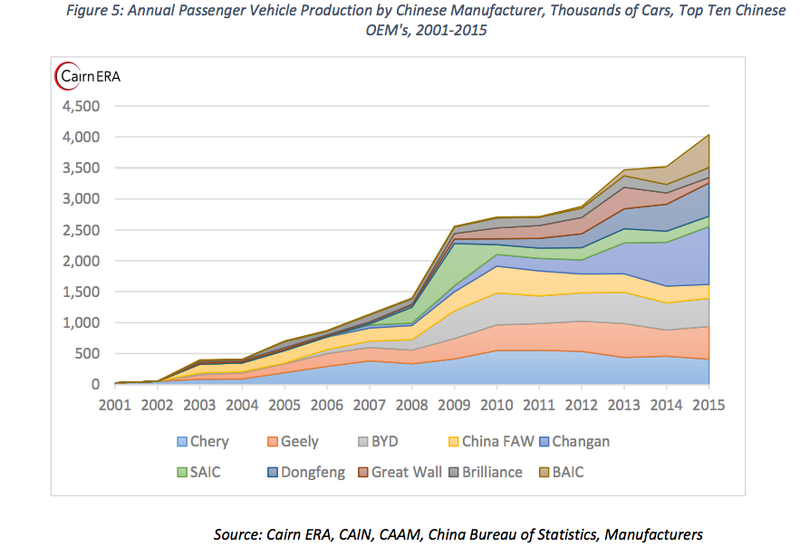 The report explores the parallels between the Chinese car market, which has grown from 1.4 million cars sold in the year 2000 to a record 24 million passenger cars sold in 2015 with almost all of those cars being domestically manufactured, and Tesla’s plan to go from ~600 vehicles manufactured in 2010 to 500,000 vehicles in 2018. Based on our analysis, three of the top ten car companies in China reached or exceeded the growth rate that Tesla will need to reach over the next three years. We think the most likely scenario is for Tesla to produce 450,000 cars in 2018. While some of China’s automakers have outpaced the growth rate required for Tesla to achieve 500,000 units in 2018, Jaffe remains more conservative since the average growth of the ten domestic and non-joint-venture companies is 85.9% and if applied to Tesla, it would result in the production of 340,000 cars in 2018. He states that 500,000 vehicles in 2018 is still “plausible, if aggressive”. To get to a production rate of 500,000 cars in 2018, Tesla would actually have to grow at only 30% of the rate its Chinese peers were able to reach during their strongest three-year period of growth. It offers an interesting perspective.